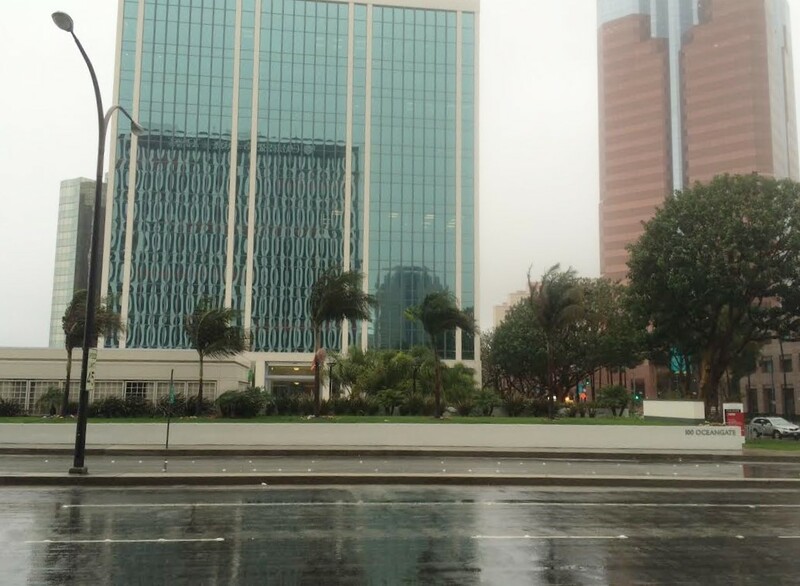 The second of four El Niño storms swept through Long Beach Tuesday morning with heavy rain. The first of this week’s storms occurred on Monday and was declared weak. The current forecast predicts precipitation every day through Saturday and for temperatures to be about the same as today, at 60 degrees Fahrenheit in Long Beach. While no significant collisions have been reported today, the Long Beach Police Department (LBPD) advised drivers to increase their awareness on the road, to turn on their headlights and proceed with caution. Long Beach Fire Department spokesperson Jake Heflin advised residents to stay at home and off the road if they’re in a position where it’s not necessary to travel. Aside from this recent rescue, Heflin says that no other significant incidents have occurred today. Long Beach’s Swiftwater Rescue Team has been deployed due to the rain to monitor the entire city in anticipation of an incident and have escorted various homeless encampments out of the San Gabriel Riverbed. On the Peninsula, berms have been built and are holding firm against the current weather system, while experts predict a potential six-to-eight-inch increase in sea levels with the “surge” associated with these types of weather events, Heflin told the Post. Residents and mariners are advised to consider the possible rip currents, coastal erosion and larger waves. “We have some protection from the break wall in the water out there, but again, we’re certainly prone to flooding in the peninsula area and that’s why we’ve taken the extra precautionary measures with the construction of the sand berms,” he added. According to the National Weather Service, a slight chance of thunderstorms are predicted over coastal waters this afternoon and again on Wednesday into evening hours. Any thunderstorm that occurs would produce gale-force winds and “rough seas, dangerous cloud-to-water lightning, heavy rainfall with reduced visibility, small hail and isolated waterspouts,” said an NWS statement, according to a City News Service advisory, while “large long-period swells” are appearing off the coast this week to last Wednesday through Friday. An allotted 10 (empty) sandbags per person are available to pick up at all Fire Stations throughout Long Beach, while the following Fire Stations and locations are providing both sand and sandbags. The 1651 San Francisco Avenue yard will only have sand available, no sandbags. Sandbags are also available at Long Beach Lifeguard Headquarters at the Junipero Avenue parking lot and at 72nd Place. Click here to learn more about how to prepare and respond to the current El Niño conditions, here to sign up for AlertLongBeach and here for safe driving tips during wet weather.